Prizes at the Fishing Invitational are determined with a point system. Prizes are awarded in several divisions and categories. Points will be accumulated by the 6 anglers per fishing team. No company will combine multiple teams for points. Places 1st through 5th are awarded for each species in this division, with the exception of Tarpon Catch/Release, in which places 1st through 3rd will be awarded. For Tarpon Catch & Release, places will be decided by most points. 100-Points for each valid catch. For a catch to be valid, anglers are required to video/picture the catch with wristband and (at a minimum) touch the leader within 3-feet of fish. Tie-breakers will be decided by earliest first-tarpon caught. This is considered a boat award for the Billfish Release Division only. Places 1st through 3rd are awarded. No points are awarded towards the Overall Team award in the Blue Water Division. Points will be given to the boat only. No company will combine teams for additional points. Ties are broken by the time method. The angler who reaches the high score first shall win. Need to document actual time of billfish release on release card. Each boat will be given colored wrist bands. Each release must have video/picture of wrist band and releasing of fish. Each released fish must have different color wrist band viewable in video/picture to be a legal release to acquire points. Anglers fishing from Atlantic HMS permitted vessels and participating in Atlantic billfish tournaments must use only non-offset circle hooks when deploying natural bait or natural bait/artificial lure combinations. Billfish tournament anglers may only deploy “J”-hooks with the use of artificial lures. 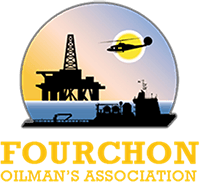 Copyright 2019 Fourchon Oilman’s Association. Site by White Car.